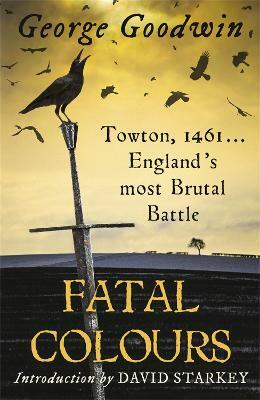 A gripping account of the Wars of the Roses battle of Towton - the most brutal day in English history. The Battle of Towton in 1461 was unique in its ferocity and brutality, as the armies of two kings of England engaged with murderous weaponry and in appalling conditions to conclude the first War of the Roses. Variously described as the largest, longest and bloodiest battle on English soil, Towton was fought with little chance of escape and none of surrender. Fatal Colours includes a cast of strong and compelling characters: a warrior queen, a ruthless king-making earl, even a papal legate who excommunicates an entire army. Combining medieval sources and modern scholarship, George Goodwin colourfully recreates the atmosphere of 15th century England and chronicles the vicious in-fighting as the increasingly embittered royal factions struggle for supremacy. George Goodwin is a history graduate of Cambridge, where he was awarded a Foundation exhibition. He is a Fellow of the Chartered Institute of Marketing. You can follow George Goodwin on Twitter at https://twitter.com/GeorgeGoodwin1 and visit his website for more information www.georgegoodwin.com.